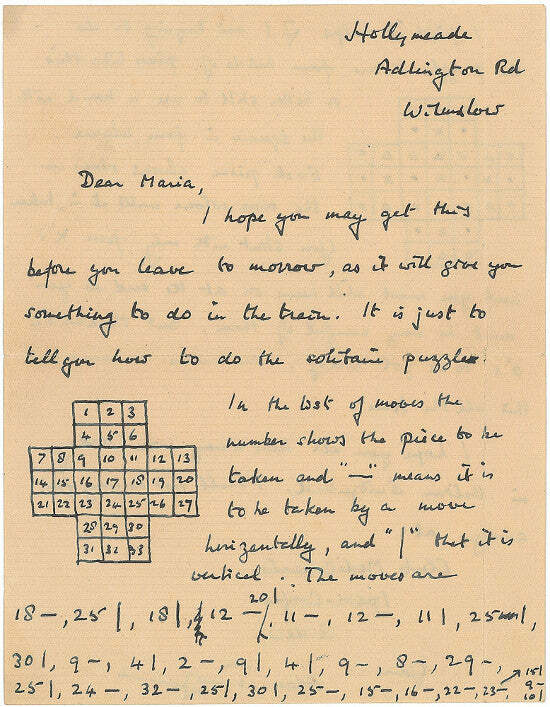 A 1953 letter by Alan Turing explaining the rules of Solitaire is to cross the block at RR Auction. It's expected to make $100,000-200,000 when bidding closes on February 10. The letter is addressed to Maria Greenbaum, the daughter of Turing's psychologist, Dr Franz Greenbaum. Turing began seeing Dr Greenbaum in 1952 and became a close friend, even accompanying the family on holidays. Sadly Greenbaum could not stop him from taking his own life just two years later, in 1954. The letter features diagrams illustrating how to play the game and represents a rare example of this great scientist offering a lesson in logic. It sold for $63,000 at Bonhams last year. Maria, now in her 70s, spoke to the Daily Mirror in 2014: "I grew very fond of him and he was always very friendly. "He eventually became more of a family friend than a patient of my father. "I remember him having dinner with us often. After dinner, he would sit on the floor with me while I played Solitaire. I thought it was so nice. "He was a very warm person who always took an interest in what I was doing. I grew very attached to him... He had quite a stammer and bit his nails. He could be described as hyped up. But I always remember him as kind and friendly." A handwritten notebook belonging to Turing containing writings on computer theory sold for $1m at Bonhams last year. Please sign up to our free newsletter to receive exciting news about autograph auctions.